Let me get this straight: I’m definitely not endorsing cheating (call it “choosing to eat off-plan” if you like) over the holidays. However, I believe that doing so is a personal choice, and if you do decide to eat off-plan on Thanksgiving, you might feel the need for a detox the next morning. Detoxes don’t have to be gross, guys. 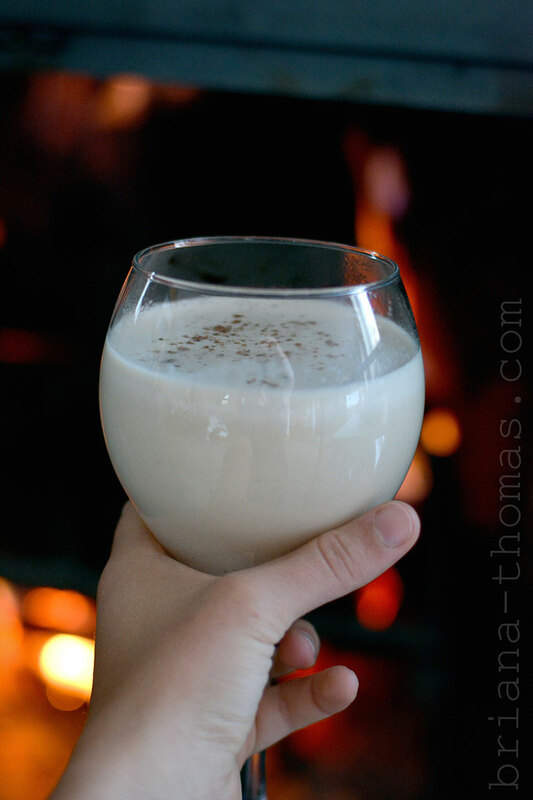 This eggnog drink is not only seasonally perfect (Black Friday isn’t about shopping; it’s about the right to put up Christmas decorations and drink eggnog! Get it right, folks. ), but it will also warm you up and refresh your body with healthy, healing fats. In case you can’t tell, I’m into Deep S recipes lately. You can thank my recent Fuel Cycle. I’ve tried to implement more Deep S recipes into my diet because I’ve found them to be more weight-loss-effective than all the Heavy S meals I have a habit of eating. I love eggnog, and my family usually makes it frozen with vanilla ice cream, lots of raw eggs, and all that good stuff. However, I wanted a hot version for when I’m really cold, which is a lot of the time, especially in the mornings. This is great for right after you get out of bed. Full of protein, full of foundation fats-it’s a great kick-start to your day! Don’t like the idea of raw egg? Well, that’s a personal choice. I’m sure there is a risk of getting deathly sick from eating undercooked eggs, so eat at your own risk and use fresh eggs to minimize the risk *or* just use the yolk (I think the whites are what are usually contaminated?). I have personally consumed copious amounts of raw egg every holiday season and lived to tell the tale (not counting all the cookie batter I’ve eaten..horrors!). In a mug in the microwave, heat the water and most of the almond milk (I usually put it in for 2-3 minutes). Reserve ¼-1/3 cup of the almond milk to "temper" the egg with (you don't have to heat this almond milk). Meanwhile, add the reserved almond milk and all other ingredients to a blender (I use my Ninja single-serve blender cup) and blend until smooth and combined. Add the hot water/almond milk and blend again immediately (so the egg doesn't have time to scramble). If you like, heat the blended drink some more, but I usually just drink it as is and it's great! *If you would like a creamier result, use more unsweetened almond milk in place of some, or all, of the water. I was just trying to be frugal. **If you're concerned about salmonella poisoning, use a pasteurized egg. These can be purchased, or you can make them at home (Google it). Be careful when blending hot liquids and vent the blender as needed to avoid a pressure buildup. As always, adjust the sweetener, extract, and spice ingredients to your own personal taste. Ninja blender – I use the single-serving cup that comes with this set all the time. THM Pure Stevia Extract Powder is my sweetener of choice and can be purchased from the Trim Healthy Mama online store. Great flavor- I’d like to figure out how to thicken this up a little more- additional gluccie, maybe? I used MCT oil instead of coconut oil. I prefer regular cold eggnog will this recipe work if I do t heat the I gredkents and just drink it cold! So I used a farm fresh egg but I was still nervous bc I’m pregnant, so I made the eggnog and then heated it in a pan to 165 with a candy thermometer. That’s the temperature that egg is cooked at. The egg didn’t set up or anything so I’m assuming it still cooked the egg properly. The drink isn’t too bad. Maybe my rum flavor was old but it didn’t taste a ton like eggnog..but when all you’re used to isn’t the sickening sweet store bought stuff it tastes loads different! Awesome awesome awesome….thanks so much. Thank you so much for this recipe! I had to search “THM detox” after today’s Christmas sugar choices… and they weren’t even that bad! I just feel so terrible now when I indulge in sugar and bad carbs. Thanks again, it is delicious and is making me feel better already! Have you tried to make this in large quantities to have on hand in the fridge ready to go? I LOVE this but it drives me crazy to get all the stuff out each time I make it! So maybe prepare on the stovetop to be sure the egg is cooked? Yes, but you’d need to blend everything first, then be sure not to cook it too hot/long or the egg will get lumpy. Or you could do things the proper way and temper the egg(s) like you would if making a custard. The Lord is using you in great ways. As we try to take care of the bodies God gave us, we are using your recipes – SUCH WONDERFUL RECIPES!!!!! Ah, thank you for this recipe, Brianna. I usually only drink one eggnog a year, because it’s so high in sugar and calories, but it’s a favorite drink. Your version is totally satisfying and I can drink it any time b/c it’s so healthy! Food freedom, I love it. 🙂 I made mine a cold version using MCT oil instead of coconut. My almond milk is past it’s expiration date and I don’t want it to go bad so I went ahead and used all almond milk. It’s a keeper! Thanks again! Do u need to eat a additional protein source with this for Deep S? Thank you so very much for all of your wonderful recipes. God has truly given you a gift! I haven’t tried one I didn’t like. Could you explain the difference between a deep S and a heavy S? I am trying to get back on track. Thanks! Hi Sheri, thank you for the sweet words. 🙂 Deep S focuses on foundation fats like butter and coconut oil, whereas heavy S includes all kinds of fats like those from cheese, cream, and nuts (i.e. the fats that can sometimes be overdone). Deep S meals focus on meat and green leafy veggies and strip out a lot of the small sources of carbs that we’re usually allowed to use in S meals, like dairy products, berries, tomatoes, onions, and low carb wraps. You can find out more about these different types of meals in the files on the main THM Facebook group, and an explanation for Deep S is found in the Fuel Cycle chapter of the old book. It’s also talked about in the new book but I can’t remember what section it’s in. To deal with my concern about the raw egg, I put it and my freshly made (thus slightly warm) almond milk, flavorings, and coconut oil, etc., in the Vitamix and ran it on the smoothie setting (which I think is 90 seconds?) Meanwhile, I heated up the water. Then I turned on the Vitamix for another smoothie setting and slowly poured the hot water in, and finally the Whey Protein Powder. It was GREAT!!! Great breakfast for me today. I am going to try this soon! For those worried about the egg, if the milk is warm enough, it will pasteurize the egg and then it is fine. Or do what I do when I make things for guests: Scramble the egg, put it in a saucepan on low heat and whisk constantly until 160*. The egg is still raw, but is then pasteurized. Or just buy the pasteurized eggs. This is really good. I left out the rum extract and used cinnamon since I dont care for nutmeg and know this is going to be a staple during the holidays! I just have to tell you that I’ve enjoyed this as written quite a few times now. I wanted some today, but not hot. I heated the almond milk in the microwave. Then I put everything else except the water in my nutribullet. I dumped in the hot almond milk and gave it a whirl. Next, I added a bunch of crushed ice to make up for the water I’d left out, and blended until smooth. It was sooooo good!! Oh my goodness!! I think you have answered all my Christmas problems! I was literally about to just throw my hands up and buy some eggnog tonight!! I LOVE eggnog, but I will drink an entire carton by myself!!! I have not done so great staying on the THM wagon over the holidays, but this is just what I need to stay on track and not feel deprived! God Bless You!!! 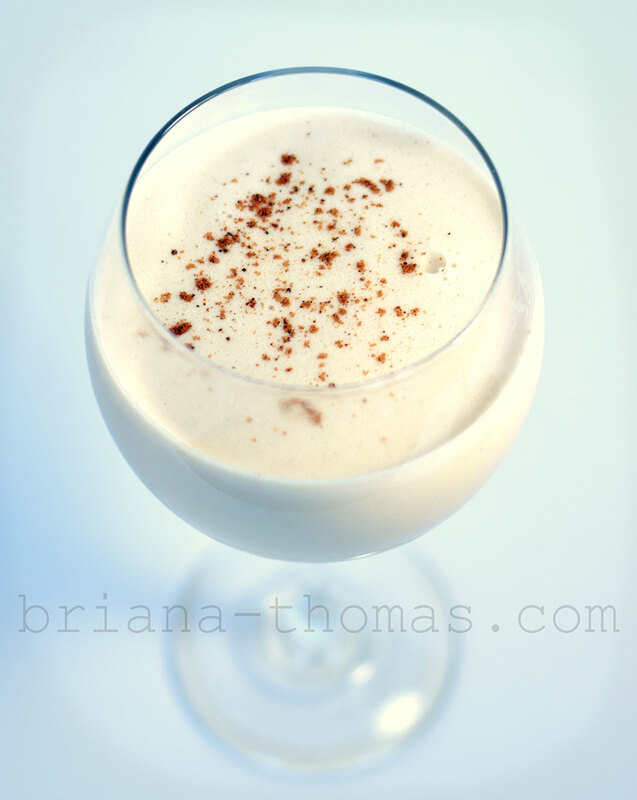 Dear Briana, just made this yummy eggnog and it was soooo delicious! To me this has been by far the most delicious drink I’ve had on plan! Thank you so much for sharing these wonderfully made thm recipes! They are so helpful in my thm journey! I really LOVE cold egg nog. .. do you know if this recipe will work cold and without gluccie? Hi Pam! 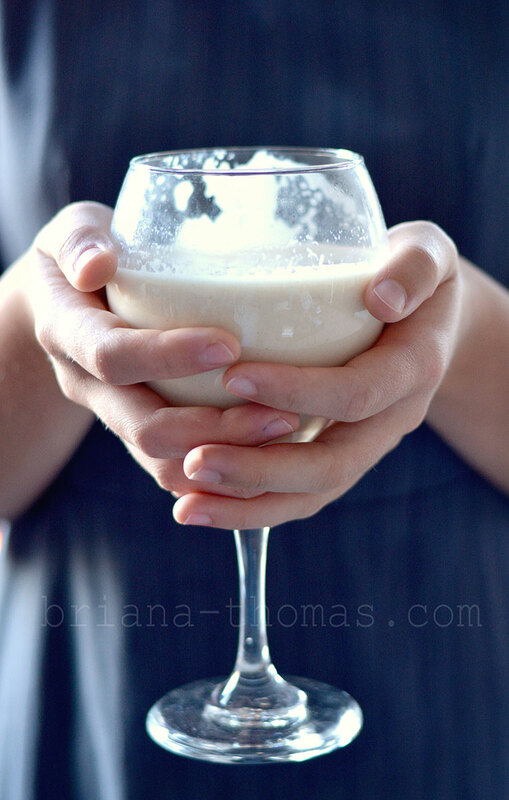 I love cold eggnog too, and my family traditionally makes *frozen* eggnog on Christmas Eve…mmmm…I’m working on that and hope to have a frozen eggnog recipe up soon. I’m sure this one would work cold. Just don’t heat the almond milk/water. The only thing I’m not sure of is how well the coconut oil will blend without the hot liquid. Maybe you could try melting the coconut oil and blending it with the egg mixture at the beginning, then adding a few ice cubes with the rest of the liquid? I’m thinking that to make it cold use MCT oil rather than coconut oil. I haven’t tried the eggnog that way yet but I make the substitution in other cold recipes. The Healing Trimmy and Trimmacino use it, so I believe it should be an acceptable substitution THM-wise. I made this the way the recipe stated, stuck in my freezer for an hour, then drank it cold/slushy. It was SOOOO good!! Thanks for a great recipe to keep me from drinking the sugar laden stuff on the grocery store shelves!!! You bet! Great idea, and I’m so glad you liked it! looks simply amazing if your not on a egg free diet. Alas, I shall have to forgo my favorite drink this holiday season. I just made this without the egg and found it be quite delicious! Just made this and it is delicious!! Thanks for the recipe! TY, Briana! I wanted to Pin this on Pinterest, but couldn’t find it. Is this already there? I think it will taste even better with fresh flavoring. Now I’m off to pin this yummy, nourishing treat! Thanks for trying it, Wendy! I’m glad it turned out well for you. I love drinking hot chocolate these cold winter evenings, but sadly decided the other night it keeps me awake. I’ve wished for something to replace it and this may be just the thing! Another amazing treat! Thank you so much for being so generous with your fantastic concoctions. I know that whenever you post a recipe, it will come out delicious! And I’m really excited to enjoy healthy egg nog all season. (Side note: I didn’t have rum extract so I used caramel and it is delicious, too!) Thank you again, Briana!